Kurt was very nervous before his first public solo. But he fared rather well, don't you think? The spotlight is on Kurt and Blaine in this scene. 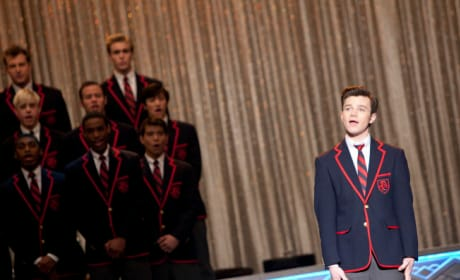 They lead the Warblers during Regionals. Do it, New Directions! The group is seen here during a performance at Regionals. How damaged does a guy have to be to be into some as annoying as Rachel? Sometimes I don't feel like we're The Warblers. I feel like we're Blaine and the Pips. Glee Round Table: "Original Song"